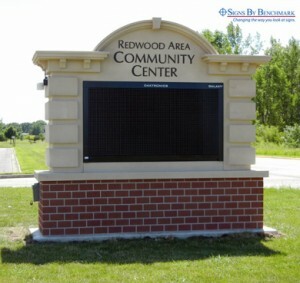 Last year, Signs By Benchmark created community signage for Redwood Falls, Minnesota. Enjoying the sign and its elegant presence, city officials wasted no time again specifying Signs By Benchmark when it came to ordering new signage for the local community center and school district building.Working with Stein Sign Display, Inc. of Watertown, South Dakota, Signs By Benchmark went to work on designing the perfect sign that would not only complement the existing structure, but would actually match the very brick and stucco of the building. 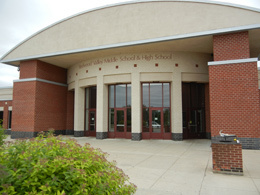 The first step in the process was to obtain high quality photos of the building elements. 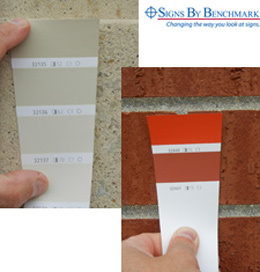 This was done by holding matching paint chips to the brick and stucco under good lighting conditions. 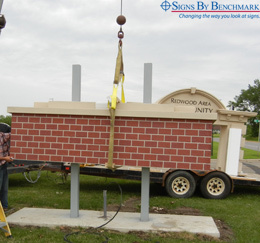 Signs By Benchmark designers used the photos, along with brick and grout measurements, to create a precise faux brick finish for the sign base and stucco for the body. 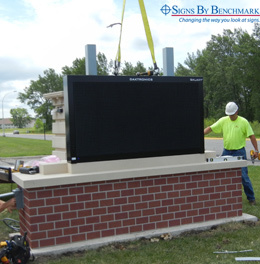 With years of experience behind them, the Signs By Benchmark creative team has become known for their innovative mindset and reliable capability to follow through from design to delivery. 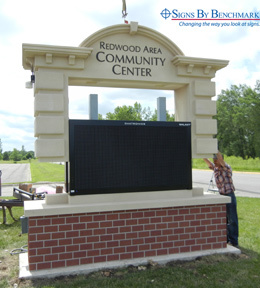 These characteristics and the skill of Stein Sign personnel contributed to another successful installation of a beautiful, durable, very functional sign that will enhance the Redwood Falls community for years to come. Call the Signs By Benchmark team today at 605-886-8084 or 800-658-3444 to discuss your unique signage needs. Take advantage of their knowledge and the flexibility of their cellular plastic medium to turn your ideas into reality! To view examples of some Signs By Benchmark signs and sign accent components (bases, pole covers and tops), click here.